To learn how to draw, the first thing you should get familiar with is the drawing tools you should be using. In saying this, many artists have different methods and may even use different tools when drawing. All I can tell you about are the pencil tools that I use to create my realistic drawings but most pencil artists will use the same drawing tools I use. You may find your own methods of using drawing tools as well. Graphite Pencils - The very first thing on your list of drawing tools should be pencils! (So obvious, right)! I use a wide range of pencils brands in my drawing including Derwent, Staedtler, and Faber Castells. These pencil brands are all professional brand pencils that provide a value range from 9H - 9B). There are also a lot of other brands out there as well that will work just as good. I recommend to my students to buy the set that has pencil degrees between 2H - 8H as they are used the most often in drawings. Some pencils sets come in degrees between 4h - 6B which is fine too. Mechanical pencils - These are great for fine details such as eyelashes or fine fur strokes. When buying a mechanical pencil they will always come with an HB lead. You can also buy higher grade leads as well for darker strokes. Be careful when using a mechanical pencil because of the thin lead it tends to break very easily. These are typically been used with arts & crafts but graphite artists have found them great for creating good clean indented lines. I use this tool mainly for creating fine white whiskers or fur strokes. You can also use a hard pencil (5H) over transparency paper to create indents in the paper. Be careful because once you have indented your drawing paper because there is no going back. 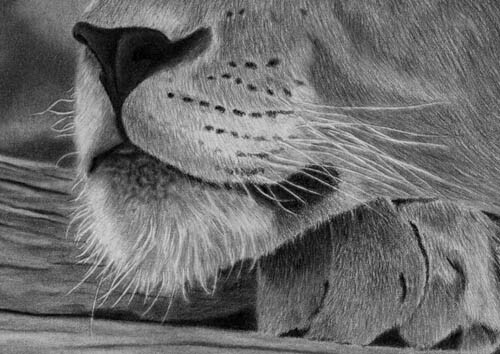 You will see in the example below how I was able to indent the whiskers and hairs around the lioness' mouth. When you shade over the indented lines they will appear. White Vinyl Eraser - Every artist needs to have a white eraser. If you have ever used a pink eraser during public school to erase errors you will know what I am talking about. Sooner or later you probably have experienced the pink residue it leaves behind. There is nothing more jaw-dropping than to be working on an almost completed drawing only to have pink smudges grounded into your drawing. So don’t take the chance and use a pink eraser. Kneaded Eraser - Kneaded erasers, also known as putty erasers, are pliable and used for picking up graphite, charcoal, conte, pastel or coloured pencil debris from your paper. It can also be used to lighten up pencil lines if they are too dark. A kneaded eraser can be shaped by your hand in achieving precise erasing. They are also excellent for bringing out highlighted areas and creating soft effects. Once they are not pliable and become dried out, it's time to buy a new one. I would recommend storing the kneaded eraser in a sandwich baggie so it doesn't collect debris from other sources.They can be pressed or pinched into any desirable shape. It won't damage or leave smears on your paper. To clean, just stretch and fold into itself which you are basically 'kneading'. away debris. Make sure you don’t use a brush that is too stiff or it can end up smearing or scratching your drawing. Having a brush is as important as your paper and pencils. It is absolutely crucial to keep your drawing clean. Where does the debris come from? 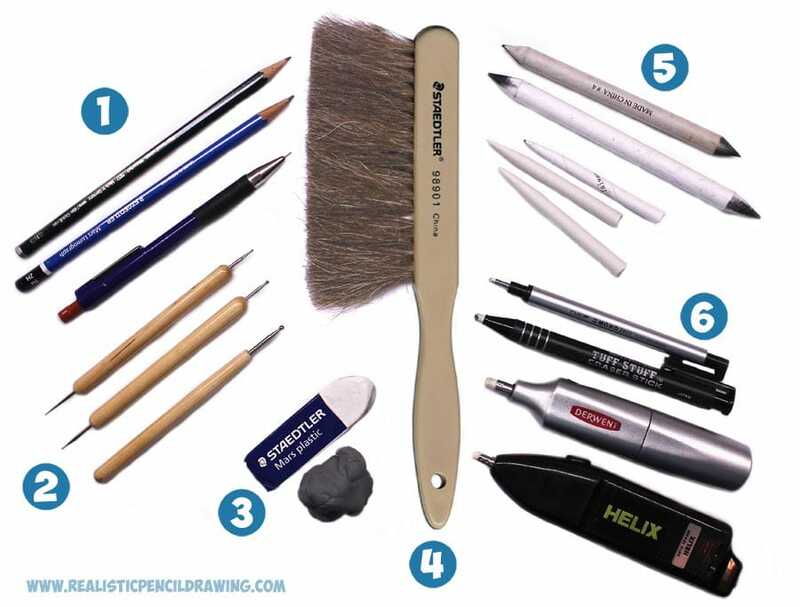 Every time you sharpen your pencil you create graphite dust and if using an eraser this can leave a residue which if not brushed way, can stick to your drawing. I would suggest wiping your brush across your drawing as often as you can. I don’t create a drawing without one. Tortillons - These tightly woven blenders come in small, medium & large. When blending with tortillons they will make the shading darker and smooth. You can buy tortillons individually or in packages. The proper way to hold a tortillon is slightly on its side. Do not blend with the tortillon being held vertically with the point of the tortillon touching your paper. If you do, sooner or later the tortillon will collapse and fold inwards. Stumps - These come in various sizes and are great for blending in large backgrounds. Stumps can be sharpened with an xacto-knife or by using a sandblock. I use blending stumps mainly for large dark backgrounds. While you can still use tortillons to shade in the larger areas of shading, a blending stump will be faster. Kleenex - Every day kleenex is an inexpensive way to help achieve a smooth & realistic look to a drawing. Don't use coloured or perfumed kleenex though because you do not want to transport it to your drawing. When blending with a kleenex make sure you place the kleenex smoothly over your first finger and then blend in the shading. Don't scrunch it up as you may not get a smooth blend. Clickable Erasers - There are two favourite clickable erasers I use in my drawings because they are thin and slender. The two I use are Sanford Tuff Stuff Eraser Sticks and Tombow Mono Zero. These are great for bringing out finely detailed highlights in fur and hair and many other details. You can also buy replaceable erasers for them too. To achieve even a finer thin line you can clip the ends of them with scissors or a blade to use the edge of the eraser. Battery Operated Erasers - Used for taking out details, highlights, and lines. Great for taking out highlights in fur in deep shadows. These erasers fit comfortably in your hands without feeling bulky and are great for precision and control.